Elliptical Carn vase - 4⅜" (111 mm) high. The small village of Nancledra is half-way down the Penzance road from St Ives. It was here, three miles south-east of Carn Naun Point, that John M Beusmans set up Carn Pottery at the Old Chapel in the early 1970s. John was born in Hampshire and moved to Cornwall with his parents who ran a retail pottery shop. His parents, incidentally, made the lampshades supplied with Troika lamps. He studied throwing at Redruth Art College. John's work is distinctive and his skills composite; he carries out the work of thrower, mould-maker and decorator. His pieces vary tremendously in shape, size and nature, but are always instantly recognizable. All his work shows a strong fascination with shape - some pieces morphing from one size and shape at the front to another at the back. 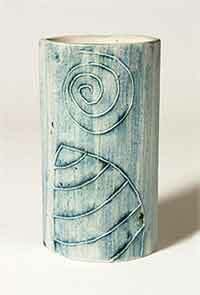 All work is slip-cast, and John usually makes several moulds from a master, each one incised with a different design. The colour is produced by applying copper oxide and copper mixed with cobalt with a mop. John, who works with one helper, fires his pots in an electric kiln at 1140°C. There is a growing army of Carn collectors, and it is fortunate for them that the pottery is still producing. The mark is a simple rubber stamp giving the name or the name and address of the pottery.